Chrysler loves to make a big splash at SEMA and they love to have their engineers at Mopar be the ones to make it happen. Being as cloy as a mischievous child with a crush, the auto maker has released a sneak peek of what they refer to as the Mopar ‘14 vehicle. The picture looks to be the back end of a Dodge Challenger decked out all in white save for a blue stripe stretching across the side and up the trunk. 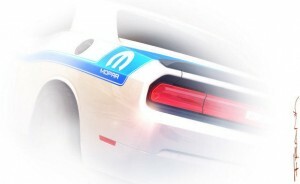 The Mopar logo appears on the stripe right next to the gas tank. The full reveal for what exactly Mopar is doing to the Dodge Challenger will be at the SEMA show in Las Vegas at the beginning of November. Chrysler will also be having a plethora of other vehicles they’ve already teased at being shown off as well. For the auto enthusiast, the SEMA show always brings out the best in Mopar. If you’re looking to upgrade your current vehicle, then contact our parts department at Bayside Chrysler Jeep Dodge. Make sure to like us on Facebook and follow us on Twitter for more news and special offers.